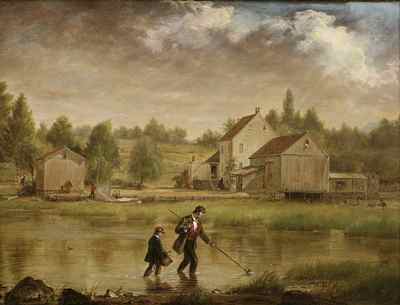 William Sidney Mount came of age during one of the most exciting periods of American art. He was born in 1807 on Long Island in Setauket, but soon moved with his family to nearby Stony Brook. Mount was educated at the National Academy of Design in New York City, the most famous American art school of the early 19th century. He divided his time between New York City and the Stony Brook area, maintaining studios in both locations. In the city he took advantage of art and culture and met often with fellow artists, writers and musicians. But the countryside also exerted its pull, for Mount constantly returned to his rural roots, soaking up the atmosphere. Long Island's characteristic landscape, with its verdant flora and engaging light, served him well in the backdrops of his most famous paintings. Mount communicated frequently with New York's Hudson River School" painters, early 19th century America's dominant group of artists, who specialized in depicting nature as sublime and awe-inspiring. He was acquainted, in fact, with the leaders of this group -- Thomas Cole, Asher B. Durand and John Frederick Kensett -- and agreed enthusiastically with them as to the importance of elevating nature as a serious subject for painters. However, there is a certain irony to Mount's constant championing of painting outdoors, or en plein air. As the artist's journals relate, although the background of every painting in this exhibition was indeed begun outside, from nature, each was in fact completed inside, in the artist's studio. The central human figures, for instance, were almost always painted indoors, where it was more comfortable for both the artist and his subjects and where Mount could more easily control pose and lighting. 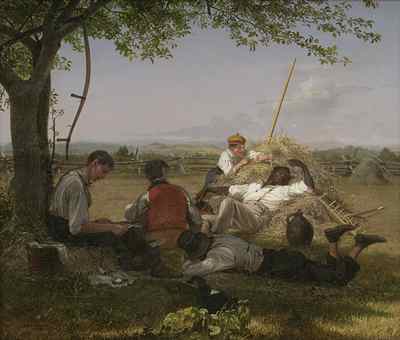 The artist's repeated extolling of the virtues of plein air painting, then, should be seen more as a reflection of then-prevalent fashion than as a literal description of his working methods. 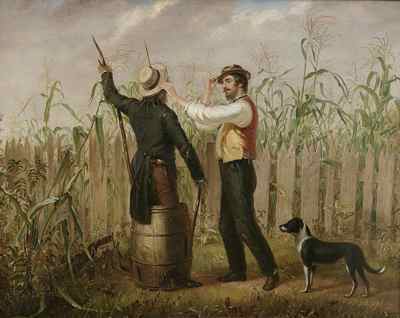 By the time of Mount's death in 1868, he had fallen under the influence of another preacher of the virtues of painting from nature. This was the English critic John Ruskin, who saw art, nature and morality as spiritually unified and advised artists to give exacting scrutiny to nature's details in order to capture and portray its essence. 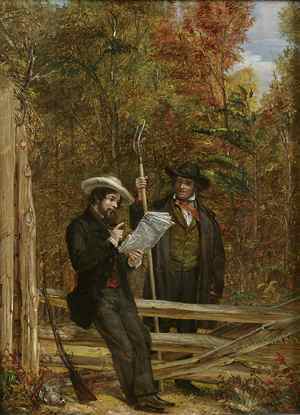 To Ruskin, every detail was important: close attention must be paid to the precise details of each individual landform, the leaves on every tree, each blade of grass and the individual cornstalks growing in the late summer sun. Or, as William Sidney Mount put it, "Truth will speak -- no second hand nature for me." Pictures painted directly from nature will always captivate, will draw the spectator near. Truth will speak -- no second hand nature for me. I must use greater diligence in future and never distrust my own abilities. But paint every thing from nature, indoors and out morning noon and night. Painting from nature in the open air will learn the artist at once the beauty of the air tints from the horizon (sic) to the foreground. See how the dew sparkles on the foliage and the grass in the sun beams early in the morning. How glorious it is to paint in the open fields, to hear the birds singing around you, to draw in the fresh air -- how thankful it makes one. Work as much as possible from nature, indoors or out. Figures painted in the open air have a wonderful effect -- providing the subject is good. A painters studio should be every where, wherever he finds a scene for a picture in doors or out. The foliage on Long Island remains greener much later than up the North river counties. Hence Long Island will be the last place in the autumn for artists to study landscape in the vicinity of New York City. My best pictures are those which I painted out of doors. I must follow my gift -- to paint figures out of doors, as well as in doors, with out regard to paint room. The longer an artist leaves nature the more feeble he gets, he therefore should constantly imitate God An artist who has given himself up to nature should pay very little attention to critiques. The canopy of heaven is the most perfect paint room for an artist. I have been sketching landscape in oil ­ good practice. If I should follow it up, I believe I would make a landscape painter. Nature, is the father and mother of art. Landscape looks rich in the morning or evening. A view taken when the sun is just up, would look sparkling. Sittings could be taken every fair morning at the same hour, some remarkable scene or effect should be selected -- The sun striking upon figures, or animals with their long shadows, etc.